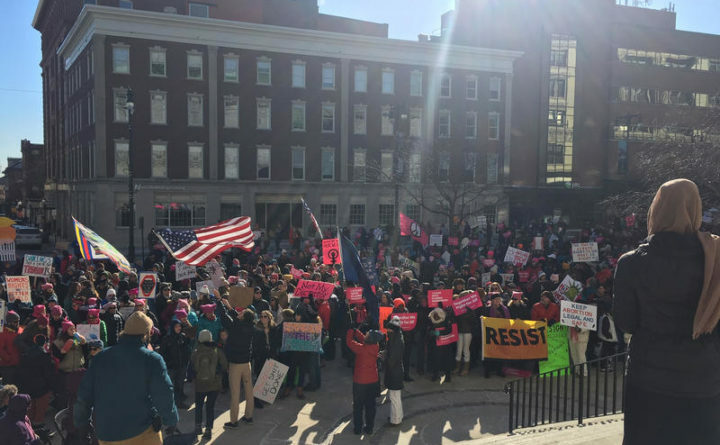 Mainers brave controversy and cold for the third women's march in Portland. Despite divisions in the movement and a looming snowstorm, around 1,000 people gathered in Portland Saturday for the third annual women’s march in solidarity with other marches across the nation. Demonstrators marched from Congress Square Park to Portland City Hall, where a half-dozen speakers addressed the crowd on a wide variety of issues. Attorney and activist Betsy Sweet was the first to speak. Two years ago, the first Women’s March was held the day after President Donald Trump’s inauguration. Demonstrators marched in Washington, D.C., and around the country, and it became one of the largest single-day protests in U.S. history. In the years since then, the movement has grown from an event to an organization with abroad agenda. The national leaders of the Women’s March did come under fire earlier this year following allegations of anti-Semitism and of excluding women of color and the LGBTQ community. The Maine’s women’s march issued a statement before Saturday’s demonstration, and organizers of the Maine event apologized to those who felt excluded. Several speakers also emphasized a need for inclusivity and unity during the rally. Rene Goddess Johnson said the most disenfranchised Mainers are missing from the local movement.